Well here's Colonel Stinson. I made her with MakeHuman. The model might not be usable though in the complete absence of animations - but her model has the rigs, so anyone with a decent animation program should be able to do it. But yes, I discussed with Rachael earlier this afternoon about giving Col. Stinson the same treatment as HintMan, with an animated model and a camera feed to replace her mugshot. In the event that her model can't be animated to suit our needs, I spent yesterday scouring my Half-Life mods library for any other potentially suitable women. This set kinda runs the gamut, so I'm sure we'lll find some of these women to be more suitable than others in the group, for various reasons. And, again, the original model is still in the running, so long as we can get it animated. I think Lexi is the only character that is even considerable as a replacement for Stinson. Stinson is not at all associated with Black Mesa in any way, and donning any of their trappings destroys her background. And I am not too fond of Army Girl, anyhow. The rest are all out of the question. There would definitely be no Black Mesa logos on whatever I put together. I would look to cover up the cleavage and/or midriff, too; Barniel, Kate, and Lexi are dressed too provocatively. Of all the models, I was thinking that Kate with the military beret looked the most suitable (except, of course, for the Black Mesa logo on her T-shirt & the badge). KateBlackShirt (minus the badge and logo on cap) could work quite well, if the stupid bare midriff could be covered up. Lexi would be my next choice, again, with the bare midriff covered. I agree on all points, Rex. Perhaps I should take a little time to look into giving them less revealing outfits tonight, even if they end up not being used for this. A little practice with texture manipulating never hurts. And if it comes to simply a matter of color, I should have no trouble editing the clothing on any of these models. I can even mix-and-match heads with bodies, to a certain degree, but I can't guarantee 100% match between them all. 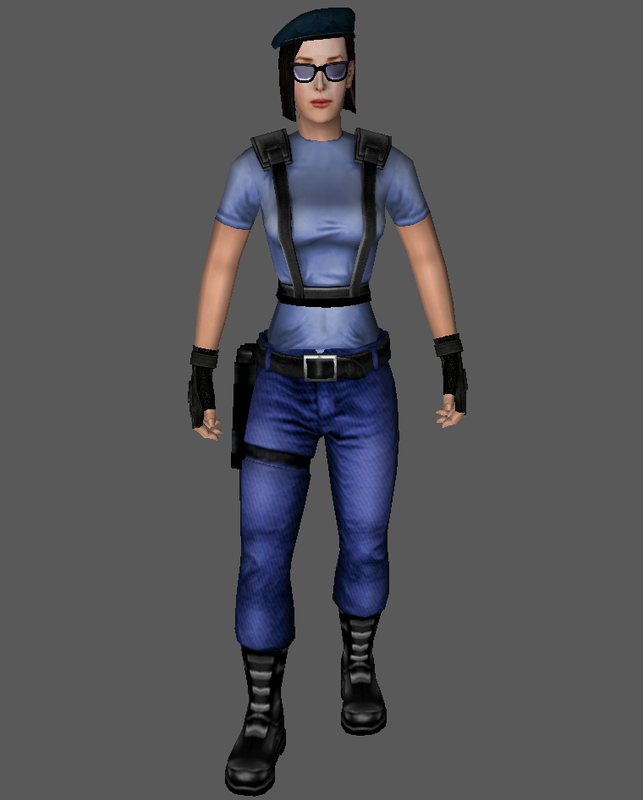 EDIT: With the resources I have, producing a Kate variant with no Black Mesa logo and a covered midriff is certainly attainable. Col. Stinson's model is now in the game. No worries. In fact, by the time you're back, there may even be more cool stuff ready to show off. Can anyone tell me the original source of the tram car from the title sequence? I can tell it doesn't come from Half-Life; the texture is much too high-resolution. You mean the open tram/trolley thing that runs along the rails in the Paranoid opening sequence? If so, I'm pretty sure I took it (perhaps modified it slightly) from either Jedi Outcast or Jedi Academy (probably the former). That's the one. Thanks for the tip! It'll be useful if I ever decide to try to add some updates or adjustments to it. I wanted to quickly ask if anyone had any thoughts about Hintman. This past week or so, I made some small tweaks to his outfit that, incidentally, look a bit closer to the original model's. At this point, if I were to remove his beret and the scar on his face, he'd look even more similar to the old Hintman. But before I do that, I figured I'd ask the group for any opinions or suggestions. Oh, and separate question: Would anyone happen to know of, or have, an archive of BlackRayne Studios' models? From what I can see, the site is gone from the web, and I wanted to examine some of the source material, since I know Paranoid makes use of their work. Please explain what you mean by "archive" and "source material". Many of the BlackRayne's models were downloaded by me and inserted into Paranoid as-is. In other words, they were completely unedited, and what made it into the game was the source material. I do know that Nigel provided some of the models in the game, but I'm not sure of their source. Also, I know that he edited some of the models (light-baking in at least one instance) I had acquired, but I don't recall which. I do have the zip files of all the BlackRayne models used in Paranoid, as well as unused models. I have 24 models in all, totaling about 12 or 13 MB. I can upload them for your use when I get a chance. The only real consideration, of course, is gender: Controller/Hintman speaks with a male voice, so having a female model won't work. [Conversely, Col. Stinson speaks with a female voice, so a male model won't work. Indeed, I made sure to stay with a male model for Hintman. I just felt it would be good to ask if anyone had any suggestions or opinions, as I aim to avoid making anyone else unhappy whenever possible, and it's never too late to make adjustments. Please explain what you mean by "archive" and "source material". Many of the BlackRayne's models were downloaded by me and inserted into Paranoid as-is. In other words, they were completely unedited, and what made it into the game was the source material. I just wanted to see BlackRayne's work for myself, including any items they had which aren't used in Paranoid, or any that happened to have been a base for editing. I was just wondering if perhaps someone on the team had preserved them, as they no longer seem to be available online, and I've taken an interest in examining the original versions of the assets used in Paranoid. That would be fine, but don't feel rushed over it or anything.